Why are the Eagles trying to re-sign Patrick Robinson? Before I get my first article here on 4th and Jawn underway let me get this off my chest. E-A-G-L-E-S EAGLES!!! Super Bowl Champs baby WOOOOO!!! Ok, I’m good I’m good. Happy to be a part of the 4th and Jawn family. I look forward to sharing my thoughts on the Birds throughout the off-season and into the 2018 Super Bowl title defense. Let’s chat about our Super Bowl champion Philadelphia Eagles, shall we? A report came out this week that the Eagles are looking to re-sign 2017 starting slot cornerback Patrick Robinson to a contract extension. Robinson appeared in all 19 games this season for the Eagles, playing a prominent role in their run to the Super Bowl as an elite slot corner. The former first-round pick is a perfect example of the underdog story the Eagles rode throughout the playoffs. A once highly touted prospect in the league became a journeyman, draft bust that never lived up to his potential until breaking out with Philadelphia at age 32. 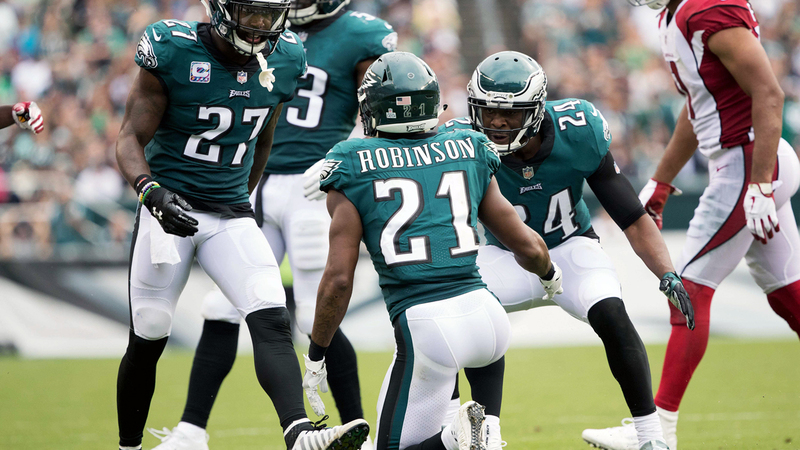 Despite Robinson’s all-pro performance this season, the Eagles hoping to extend the veteran corner has media and fans alike scratching their heads. Howie Roseman and Joe Douglas have built an impressive core of young cornerbacks through the draft and trades. With the emergence of Jalen Mills in his second season, flashes of play-making from Ronald Darby and Rasul Douglas, and the hope for Sidney Jones to meet his elite ceiling, it seems odd that the Eagles would want to bring back Robinson. Let’s dig into the thought process of the Eagles front office on this one. Patrick Robinson absolutely deserves a pay raise after significantly outplaying his 1-year $725,000 contract he signed last year in free agency. A regular season stat line of 38 tackles, 4 interceptions, and 18 pass deflections carried over into the playoffs where Robinson was lockdown. In the NFC championship game, Case Keenum had a 27.5 passer rating when targeting receivers covered by Robinson. That low passer rating was partly because of what is now a historic play in Philadelphia sports history. Pro Football Focus LOOOOVVVVEEEDDDDD Patrick Robinson in 2017. His PFF grade went up from an abysmal 45.1 with the Colts, to an 89.8 rating in Philadelphia. PFF ranked him as their 4th highest graded CB and the 45th overall player in the NFL. Simply put, Robinson played lights out in 2017 and it isn’t crazy that the Eagles want a player who was a key reason they won their first-ever Lombardi Trophy. Keeping Robinson would continue to give Defensive Coordinator Jim Schwartz optionality when it comes to safety Malcolm Jenkins. Jenkins was used all over the field again in 2017, playing only 24% of his snaps at safety. The Pro-Bowl safety lined up at linebacker 42% of the time, 30% as a slot corner, and 4% on the outside. If the Eagles lose Nigel Bradham in free agency, Jenkins may have to replicate that heavy workload at linebacker he had in 2017. Backup safety Corey Graham played a big chunk of snaps in the secondary last year because of Jenkins’s high usage around the field. Graham played 36% of the defensive snaps at safety, and was often a liability. Just go back to the second half of the Super Bowl when Malcolm Jenkins had to cover the pass-catching threats at running back for New England, forcing Corey Graham to match up with Rob Gronkowski. Gronk had his way with Graham and it was clear at 32, the veteran couldn’t run with the league’s top tight end. If the Eagles keep Patrick Robinson, that would lock the slot up for another year, perhaps giving the defense an opportunity to use Jalen Mills as this year’s Corey Graham. Considering eventually somebody would need to transition to the position anyway if they keep all the depth at CB, Mills could be a utility piece in 2018. The Eagles could use Mills at safety when Jenkins plays corner/linebacker in dime looks, and share time at corner with Sidney Jones and Ronald Darby when Jenkins is in the backfield. Mills is an aggressive tackler and has better close in speed than Graham or Rasul Douglas (who I think is another option at safety next season and into the future) (Mills ran a 4.48 at his LSU pro day). He also played some safety at LSU. Not to mention Mills played extremely well on Gronk in the first half of the Super Bowl. It isn’t a lock that Patrick Robinson is back even if the Eagles have expressed interest as reported. Spotrac.com projects Robinson’s next contract at 3 years $6 million annually, which just doesn’t seem realistic for the Eagles and their tight salary cap situation unless he feels indebted to the team and takes a team friendly deal. It also just doesn’t make sense for the Eagles to overpay for a 30-year-old cornerback when they have so much depth at the position. Mills has thrived at CB and if Jones and Darby/Douglas reach their ceiling on the outside, Mills could play the slot well. Chris Landry a former NFL scout referred to Mills as a “pure slot corner” before he was drafted. Time will tell what Patrick Robinson’s future with the team is. NFL free agency begins March 12th and if Robinson wants to test the market, the Eagles probably will be priced out.